Be the first to share your favorite memory, photo or story of Dorotha. This memorial page is dedicated for family, friends and future generations to celebrate the life of their loved one. Amherst - Dorotha Louise Garrett Ramsey, of Amherst, went home to be with the Lord Friday, November 30, 2018. 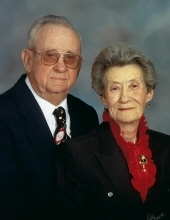 She was the beloved wife for 59 years to Jesse Witt Ramsey. Born August 28, 1930 in Charlotte Courthouse, Mrs. Ramsey was the daughter of the late John Washington Garrett and Ester Etolia Dobbins Garrett. She was a retired seamstress who sewed most of her life for Amherst County and beyond. She was a member of Bethel Baptist Church in Amherst. She is survived by two sons: Rodger Russell Ramsey and wife Terri, of Winchester, and Charles Kester Ramsey of Franklin, NY; two daughters: Rosa Kay R. Myotte and husband, Arnie, of Conyers, GA, and Dottie Lou R. Ramsey and husband, Russell of Amherst, one daughter-in-law, Debra Ramsey of Bentonville; ten grandchildren; 14 great-grandchildren; one great-great-grandchild, and one sister-in-law, Mary Garrett of Martinsville. She was preceded in death by one son, McKinnley Wayne Ramsey; and two brothers: John Thomas Garret, and James Wenthford Garrett. We would like to thank all the CNA’s, Nurses and Staff of Lovingston Health Care and Albemarle Health and Rehabilitation for the loving care given our mother. Funeral services will be conducted at 2:00 PM, Tuesday, December 4, 2018 at Driskill Funeral Chapel, Amherst with Pastor Dave Peters, Rev. Glynn Coleman and Pastor Russell Snoddy officiating. Burial will follow in Amherst Cemetery. The family will receive friends beginning at 1:00 pm, Tuesday at the funeral home and other times at Mrs. Ramsey’s home. Memorial Contributions may be made to Bethel Baptist Church, Missionary Fund, P.O. 1200, Amherst, VA 24521. To send flowers or a remembrance gift to the family of Dorotha Louise Ramsey, please visit our Tribute Store. "Email Address" would like to share the life celebration of Dorotha Louise Ramsey. Click on the "link" to go to share a favorite memory or leave a condolence message for the family.